The menu is housed in an empty cassette case, the toilet is hidden behind a secret door in the wall and the cocktails have such cringe-o names as 'Ume? Yes You' and 'Fennel Countdown'. Sure, Callooh Callay sounds gimmicky, but the tipples at this long-established Shoreditch bar are the real deal. The staff are friendly and knowledgeable (no moody, 'I'm actually in a band’ hipsters serve here) and mix delectable elixirs like vodka and rhubarb with vanilla shrub and whisky with apricot jam and chocolate bitters (just ignore the names). 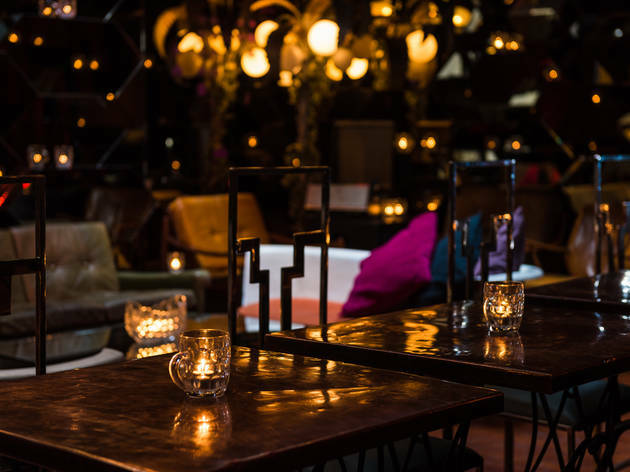 The exposed brick walls, Milk Tray-coloured soft furnishings and abundance of tealights make Callooh Callay a very cosy spot to sit. Neither trashy nor pretentious, the vibe here is fun but still stylish, and, unlike in neighbouring bars, you won't be surrounded by swarms of obnoxious suits or stag-dos. I got well sauced on the free punch at the Callooh Callay Summer party a year or so ago and have been a little scared to show my face there ever since. But actually, I needn't have feared - the bar staff are lovely, even though when we ordered I did get a slightly worried look from one the bar staff who obviously recognised me ("Are you sure you would like to order that? 'You know...after last time?'). All I can say is, avoid the free punch at parties. But the bar is small and intimate, with an ever-changing award-winning cocktail list, and the Gnome fishbowl cocktail is a real crowd-pleaser. My aim in life is to get a gold key for the JubJub bar upstairs. Interesting cocktail list, with none of your 'standard' cocktails, which makes you try something new (which was fun). Their branding/decor is inconsistent and doesn't really work together, slightly Alice in wonderland/Narnia themed, but then another room had a seedy gentleman's club feel and the menu looked like a rip off of an apple commercial. The drinks were tasty, not the best I've had in London and are quite small for on average £11 a drink. The service was great, attentive but unobtrusive. An all-around strange and disappointing experience. Being a real cocktail fan and having been based in East London for so many years Callooh Callay has been a mainstay on my 'to do' list for quite some time and I kind of expected greatness given all it's supposed awards. I popped in just after 6pm one evening to catch up with a friend and was greeted by a waitress whose 100 mile-an-hour descriptions of the drinks and the bar left us feeling uneasy. She told us the menu had just undergone a redesign which we thought was a joke given that the bar is meant to be Lewis Carroll themed but the menu is printed with 1st generation iPod imagery using neon colours and black silhouettes - it's a surreal clash of branding to say the least. Drinks are heftily expensive but no more special than can be found in a branch of London Cocktail Club for example. Perhaps it is the inclusion of distant ingredients such as foreign sounding fruit zest or one rare type of liqueur which was actually described as 'liquid gold'. Said liquid gold was served in a tiny Chinese tea cup, set us back £11 and was bitter at best. Maybe they expect customers to be in and out quite quickly because we were told we could site wherever we wanted but were then interrupted to be shuffled from side to side as multiple times as the place filled out. I was quite glad to be on my way and I'm never usually in favour of leaving a cocktail bar - it was all very bizarre. When a bar is pre-faced as being voted one of the top 50 bars in the world it sets the bar (pardon the pun) very high, but for me it didn't disappoint. We were seated inside the hidden wardrobe section, and our waitress was very friendly and knowledgeable. There was such a varied selection of cocktails that she had to assist most of us in making a choice but everyone was happy with her suggestions when they arrived! Considering we had to book so far in advance I expected it to be a lot busier, there seemed to be a lot of available space. The same went for the elusive 'palace' upstairs. Overall a wonderful experience for a few very tasty cocktails. Definitely couldn't stay here for too many rounds, and I agree with reviews below that they are a wee bit small for the cost - but I think as they are so beautifully made and interesting combinations I'd be happy to go again. I visited Callooh Callay a couple of times and each time have really enjoyed my experience. I have been on Sunday evenings, one time I needed to book the other time it probably wasn't necessary, however if you do book, make sure you ask to be seated in the cupboard (hidden bar) - it is a bit quieter and easier to have a conversation. Music is I found to be very good, now for the cocktails. Really good selection, however they can be a bit small for the price. The waiters I found to be very helpful if I was stuck for choice as they could recommend something that would hit the spot. Personally I really like the sticker book and the first time I visited the menu was in an old cassette box! Worth checking out, but expect some expensive drinks! I have been here more than once. My experience is mix and after deciding I have enough of exploring their quirky and bottomless new cocktails, I am writing a review. Coktail menu is LONG and QUIRKY. Presentation can be great but taste.... hhhmmmm not always hit the right spot. Described as one of the best cocktail bar in London, Calloh Callay was a small deception for me. Don’t take me wrong, the place is really good, nice music, great bites, especially, delicious scotch eggs, but the cocktails are not that good; not bad, but not exceptional. I don’t see the work behind and I rarely had this simply presented cocktail. This is making the venue losing in quality unfortunately to see the cocktail presentation being that neglected. If you are going, ask to be either upstairs or in the front room, the back room ,when I went was boring and quiet while the front room was offering a much better time! Especially you may feel a bit left on the side when being there. As I went on a Thursday I was expected the place to be a bit more lively. I'm noticing some of the reviews are mentioning the reserved seating area, however my review will be from the point of view from the walk-in bar at the front. I defiantly think this is a great spot for a first date, the cocktail sticker book is fun, and the names and flavours are good opportunities to help as starter points for some conversation. During my date we were sat at the front and the bartender serving us was really entertaining and chatty, which provided a nice energy for the date where we were both a bit nervous. The toilets had really cool decor and the venue is intriguing enough that I would be interested to see what the rest of it is like. While the cocktails were visually appealing, some were quite pricey for their size, and they were easy to consume quite quick even for the slowest of drinkers. Having said that as a drinking experience out of the usual places to go, this was certainly memorable. 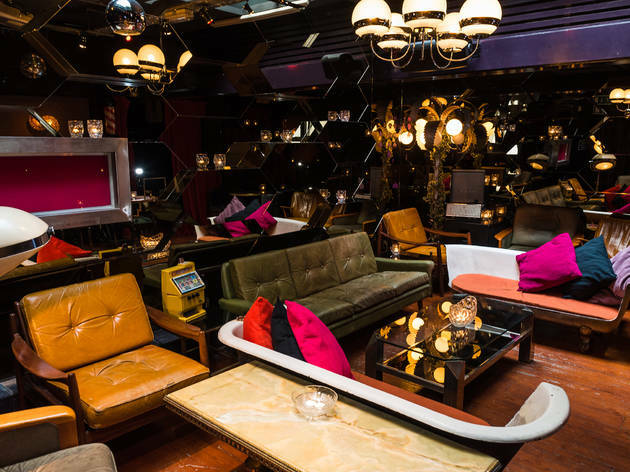 Cool, quirky bar hidden in Shoreditch with funky cocktails. It gets quite busy in the evenings and on weekend so I would advise on booking if you want a table. The hidden bar is quieter than the first area you walk in. They have a great selection of cocktails with an ever changing way of presenting the menu. My personal favourite was the sticker book, where you were given a sticker each time you ordered a drink making you want to keep coming back for more. I do really like this bar but there is a stench in the bar that hits you as soon as you walk in - kind of like damp, mouldy alcohol. The cocktails are also on the pricey side. Great range of cocktails and the drinks menu was presented in a cassette case. The front of the bar is always buzzing so book a place in the hidden back bar if you want something more chilled. I enjoyed walking though the closet door to get to the other bar and toilets. Worth a visit to see the little quirks and sample some of the cocktails. We came here for drinks and giggles.... Though we got both I can't say it was the time of my life ... It felt a little over crowded for my tastes and a little loud... It could be the day I went but that's what I got. Callooh Callay's reserved seating area is much calmer than the larger bar up front reserved for walk-ins, and it benefits from it. The music is low enough for you to hear the person sitting beside you, and the lighting atmospheric but practical. It's nice to find a table service bar in a bustling street full of clubs, and CC's cocktail menu is more innovative than most, offering up a sticker album for you to gradually complete as you order each drink. These are a fun idea and a good conversation starter, which is good as there's little else of note. The decor is a little tacky - think neon lights, geometric walls and palm trees. The drinks, meanwhile, were palatable, but nothing wowed and it's a shame you can't get a cocktail for under £10 a pop. But hey, I knew the prices before I arrived, and the service was attentive and friendly, so I can't really complain. I tell myself that it's worth the premium to not have to stand in a sweaty queue! Cool venue, friendly staff, great drinks. They've gamified cocktail drinking with a cocktail sticker book.. drinking gamification! The cocktails are a little pricey, so completing the sticker book may come at a significant financial cost! Apart from this novelty though, it's a really nice bar, thought the staff were incredibly friendly, music was great and the decor is good. This place is perfect for a first date. Kind of dark, the music quiet enough to talk, and the novelty sticker book that you have to fill up adds a quirky element to the date. But be careful the cocktails are strong, after your 3rd you'll be needing some carbs to soak up the alcohol. Going on a weekday helps you avoid the crowds, and unlike the rest of these reviews, the staff was really attentive and nice. Go here if you want to feel like a hipster without really being one. Pricy, but totally worth it. Intimate, quirky and a nice crowd. Great bar if you're looking for something slightly different in the Shoreditch scene. First time coming here was for my friend's birthday, we had tables reserved next to the windows. Staff was attentive and accommodating. Cocktails are on the pricier side but they dont disappoint. The second part of the place, the one you get trough the wardrobe, is quite interesting and it calls for ''date spot'' label. Back in the day Callooh Callay was the best secret door, hidden bar in London. Unfortunately for CC, a lot of newer places have opened up offering better value for money and more interesting concepts and they havent bothered to update at all over the years. Such a shame as it used to be a great place. Hopefully they will think about doing a refurb and coming up with something new! I booked a table in advance and went through the wardrobe (literally) to get to the sitting area. Quirky cocktail menu and cocktails, good music, funky decor, cheap and tasty food and friendly service. For best service, book in advance and ask for a table behind the Narnia door! There are a couple more bars behind that door and they're a lot more comfortable with different cocktail and snack menus. Amazing decor, yummy cocktails and staff are really nice. This place is always good fun and the cocktails are delicious. The half bathtub seats are brilliant and if you're lucky you might get to go to the bar upstairs which is a little more decadent with slightly more comfortable seating along with a more bespoke service at the bar. Definitely worth booking if you can for this place as the guys on the door can get a little arsey when it's busy. The menu was cool and quirky - you'll see when you go. The cocktails were pretty weird though. There were no normal cocktails, so you had to try something new. Mine had marmite in it. I love marmite. Like actually love marmite. I wasn't a fan of the cocktail. Lesson learnt - marmite = tequila is not nice. Always a fan of a speakeasy, secret bar. Especially one where you walk through the Narnia cupboard to get there. Top points for that, and the drinks were good too. I enjoyed the menus being in oyster card holders. It feels quirky and fun here and the staff were friendly. Random aside: when I got through the cupboard, I couldn't help but feel a little underwhelmed. The decor sort of felt like Abacus (naff nasty nightclub in the city) which I frequented in my late teens. However, that may just be my own twisted self/high standards nonsense. You'll like the cocktails. So go. Very trendy place right off the street. The decoration is very cool, and the drinks even cooler. The staff are bubbly and nice. Serving Walter to you as you drink your cocktails. Good place to go for a post or pre meal drink. The cocktails are a little pricy at £9.50 but more than worth it!!! Went for my fiancees birthday and was welcomed with a very rude greeting from the doorman. We had a seat booked in the tequila bar, a windowless cramped room which was empty of people and atmosphere. Cocktails were very ordinary for a place which boasts to be 'one of the best in london' someone must have been high when they wrote that review for one of the leading papers. would not go back. I went there for my birthday and booked a table in the VIP area. My friends bought a cake. I wasn't allowed to eat it there due to health and safety reasons! The manager and staff were far from helpful and quite frankly pretentious. I would NOT recommend this bar to anyone, rude and above their station! Good atmosphere and music. Quirky decor. The service was fine but a bit slow. Lovely decor. cool idea but staff are incompetent and rude, not to mention short changing me. I complained. bar manager accused me of lying. never ever will I go back and neither should u visit!!! I don't understand why customer service is still so appalling in some places in London. Rude staff who are so far up their own bottoms that they can't accommodate you with a simple drink. I just don't understand the point of making your customers feel tiny. Disappointed. Go somewhere with more class, these people need lessons in basic manners. Bar is so magical u might feel like in little wonderland..coctails are awsome and staff is actually very nice and friendly.. its worth to go there! avoid this place like the plague, only go if you enjoy being treated badly by the most pretentious people in the world. I went to this place a couple of times, trusting TO reviews when it first opened. In both cases I was received by pretentious staff into an even more pretentious bar. I guess that it ticks all the boxes of TO reviewers - "quirky" atmosphere, young pretentious barmans, people wanted to be seen and theme-based. 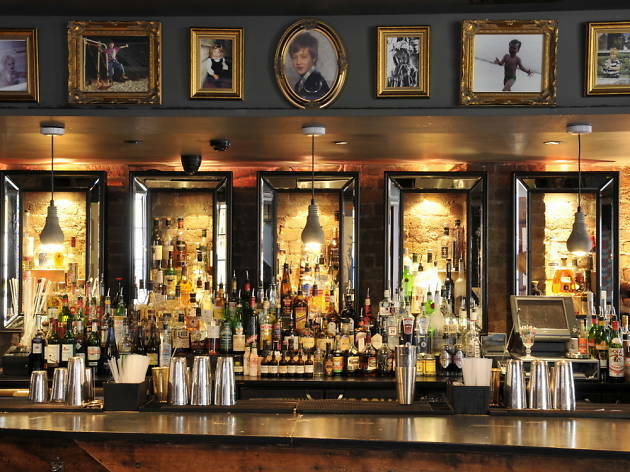 There are a hundred more interesting places to check before venturing in this posh average cocktail bar. The bar itself is nice. The smoking area and toilets are cool (With the cassette tapes on the wall) And too be honest that's as good as it gets. This whole idea of entering to the next bar/seating area through a wardrobe is a total hype! Its just a normal door... you just walk through...with a wardrobe type exterior. The reason why i give this bar 1 star is ALL due to the customer service and the rudeness of the staff. Pushing past customers, passive aggressively telling you to move (no please or thank you), making you wait for tables you have booked, very unaccommodating. Tried to ruin my birthday as i had 2 extra people with my party and wouldn't give us ONE extra chair. Great cocktails and cool atmosphere. Liked the service too. good cocktails. attentive staff. fun atmosphere. My girlfriend organised an event here last week and everything was great, from the organisation to the food and drink, service and music. Thankyou! Two stars for a midweek visit. The cocktails are great. No stars for the weekend, at which point the place becomes a shambles. Still, judging by how rammed it is on a Friday or Saturday night, the majority of the crowd don't mind waiting half an hour for a drink, stepping over eggshells around their precious staff, or not being able to stand anywhere without being in someone's way because the place is so overcrowded. I don't know whether they're aiming for an inclusive or exclusive atmosphere but they fall wide of the mark in either direction here. Love this place. The decor is cool but for me it’s about the staff and the drinks. I prefer to go early week when it’s not packed. Pull up a stool, chat the the bartenders and have a good drink. Attended a friend's birthday in the back bar here a while ago, and it was laughably bad. We were told not to go to the bar in the front, but to rely on the waiter service; this was so slow that it meant about an hour between rounds. The "eclectic" furniture was placed uselessly facing nothing; when we tried to move it so we could actually talk to each other while seated, we were told not to; everything was just the way the owners liked it, and who were we mere customers to argue? So we all stood around barely drinking, admiring the furniture instead. Who needs to sit, when you could be looking at half a bath with a cushion in it? A bath, I tell you! Zany. Then at around 10pm, we were all told to leave, as the "second sitting" were expected soon. I've never encountered anything as preposterous as sittings at a bar before; I can only presume it's a vain attempt to manufacture exclusivity, or maybe it was just to rub in our faces the fact that we had not, in fact, ever actually sat. Maybe they just want as many people to see their bath as possible. Either way, I've rarely been as glad to get kicked out of a venue. Avoid. Nice decor and some fun ideas but has gotten really pretentious. The bar can be totally empty and the guy with the clipboard will tell you all the tables are reserved. Which they have been and will later be full of hen do's or the type of people that put a schedule together for their big night out. The cocktails are ok but you can get much better in nearby places that have a better atmosphere and are friendly. I can't praise this place highly enough. I had arranged birthday drinks, but more people came than I'd expected. Yet the staff went out of their way to accommodate us without too much fuss, even though it was a busy Friday night. In general, the service was faultless from start to finish, very friendly and attentive. The cocktails were inventive and delicious, bar snacks disappeared within minutes they were so tasty and the general ambiance was relaxed, stylish but without pretension. I would definitely return to Calloo Callay, although next time I'll make sure I book for the right number so as to give the lovely staff an easier time of it! Highly recommended. Went to CC last night and had a fantastic evening. We were greeting with a big smile upon entering, and shown to a cosy table in the corner. We soon realised we were sitting on an old bath, chopped in half. Beautiful sequined cushions ensured it was perfectly comfortable though, and the exciting décor made the evening all the more enjoyable. The staff were superb, giving us plenty of time to select our cocktails, which were all very tasty - I recommend the popcorn and cola! We stayed for hours and had, by the end, sampled most of the cocktails on the menu! The table service was great, but it is well worth while going up to the bar to see your cocktails being made - it is captivating stuff. My favourite cocktail bar in London right now. This isn't a bar for everyone. The cocktails cost more than they do down the road, but they taste beter. You have to pay for service, cos it's worth it to be doted on. No one has ever been rude to me at Callooh Callay but then I always call ahead, and am never drunk or demanding.